It's hard to believe in these pictures that it was actually very spring like, but hey, you win some and you lose some. But whilst I'm here with my second instalment for my collaboration with BowsBoutique, I wanted to chat about all things self love. You may have noticed how quiet things have been with regard to style and basically any pictures of myself - the same has gone for instagram and snapchat. Few and far are the selfies I used to love and even fewer are outfit or style shots. And sure, part of that is because my brother moved off to uni and I therefore lost my go-to picture guy, but that obviously wasn't the only reason. In the world of style and fashion blogging, things tend to go one way or the other - plus size or slim beans. And there is nothing wrong with that, but I felt like I was just stuck in the middle. I'm not the sizes plus-sized brands want and I'm not the size 10 that many other instagrammable brands desire. I avoid anything strapless. I need clothes that I can get away with wearing a bra with and I point blank ignore anything swimwear related. But that doesn't mean I'm not confident. On a day to day, there are very few issues with my confidence. I'm working really hard in the gym at the moment and am seeing major progress with my strength and fitness but it seems that whenever there was that added pressure of working with a brand or posting these things on the internet, that confidence dissipated. 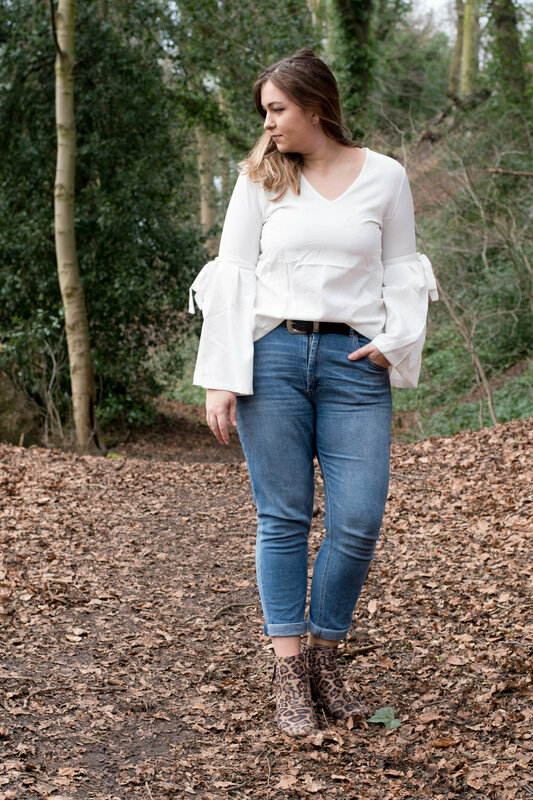 Because in some way I knew that these clothes would look miles better on a size 8 and even as I was editing these photos, I had to bite back snarky and cruel remarks about the Mom jeans I chose to wear. But I feel like whilst I do still have those insecurities, editing these last few photos has really been a change in how I feel about myself. I went through them with my friend who took the pictures and I genuinely loved them. And ironically, I loved all the pictures that I would normally have hangups on. We're talking the pictures where my posture was hunched, the pictures where I didn't get my angles right and the pictures where my bum looked massive. But in all those pictures, I'm genuinely having fun and laughing, and I don't care that they're not my best. Because my self worth isn't determined on how many followers I have on instagram, or how many brands regram my images - because my friendships weren't built based on this blog, they were built based on me (even when I'm wearing joggers and jumpers that are 3 sizes too big). And I feel like whilst this might be second nature to some people, I almost feel like crying with absolute joy that I've reached this point. I know I'll remain in that awkward in between of style blogging, but for once I don't care. I like clothes and I like how I look in my pictures and whilst I have this blog, what more can you expect? Don't forget to check out BowsBoutique for gems like this gorgeous jacket & flared sleeve top!